Faster than rotary and they use less grit, polish and electricity per pound of rock. 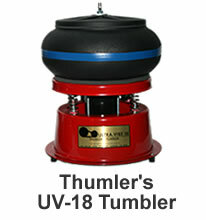 This is a new small capacity vibratory rock tumbler manufactured by Thumler's Tumblers. It is the perfect vibratory tumbler for those that run small rotary tumblers, who prefer smaller batches, or for people that need to test their process on a new or difficult material. The smaller size of the Mini Bowl's bowl makes for easier clean up and rinsing between steps compared to the larger UV vibratory tumblers below. Like all vibratory tumblers, the Ultra-Vibe Mini Bowl uses a three-step tumbling process starting with medium (150/220) grit, then fine (500) grit, and the finishing up with polish. The bowl is constructed of heavy-duty polyethylene and will last through many batches of rocks with proper use. 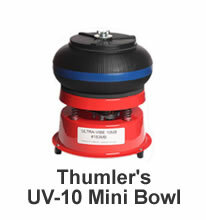 The UV Mini Bowl can handle rocks up to about 1 3/4 inches in diameter. Only a few pieces of that size should be in the bowl per load as they need to be surrounded by ceramic media or smaller rock. The smaller material is needed to increase the points of contact so the grit can grind and smooth all surfaces of those larger pieces. It is a durable, fast-working, and economical tumbler that will last a long time. More Information! 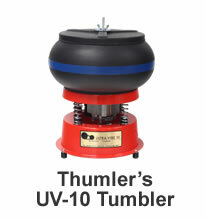 This is the industrial version of the UV-10 designed for tumble polishing rocks. This tumbler will process about 10 pounds of material at a time. If you currently run and A-R12 or Model B rotary tumbler this vibratory tumbler is about the perfect size to finish the medium thru polish steps. It will save time, grit and electricity compared to finishing them in the rotary tumbler. Like the Lot-o-Tumblers below, the U-V10 uses a three-step tumbling process starting with medium grit (150/220), then fine grit (500 or 600), then polishing with your favorite rock polishing compound. It is a heavy-duty tumbler designed to tumble rocks - don't confuse it with the brass tumbling model that is lightweight and costs less. The U-V10 industrial can tumble rocks up to about three inches in diameter - about two or three that size per load if they are surrounded by ceramic media or smaller rocks ranging from 3/8" to 1 1/2" in size. The UV-10 industrial tumbler is a high quality machine that will last for years of use. More Information! This UV-18 vibratory tumbler has almost double the capacity of the UV-10 listed above. It also has a more powerful motor, larger base and stronger springs. It will process an 18-pound load of rocks or about 200 to 700 brass casings depending upon caliber. The UV-18 industrial tumbler is perfect for people that have access to a lot of rough and for those that like to produce large quantities of tumbled stones quickly. Like the other vibratory tumblers on this page, the U-V18 uses a three-step tumbling process starting with medium grit (150/220), then fine grit (500 or 600), then polishing with your favorite rock polishing compound. It is a heavy-duty tumbler designed to tumble rocks - do not confuse it with the standard brass tumbling model that is lightweight and costs less. The U-V18 can tumble rocks up to about three inches in diameter - about two or three that size per load if they are surrounded by ceramic media or smaller rocks ranging from 3/8" to 1 1/2" in size. It is a quality, economical, and fast tumbler that will last for many years. More Information! This is our favorite vibratory rock tumbler. 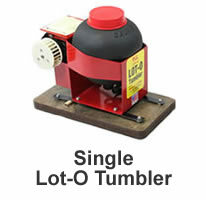 The Lot-o-Tumbler Single can tumble a four-pound load of rocks from start to finish in about one week. We start by loading our rocks, filling the barrel with water, and then inverting the barrel and allowing the water to drain. Now you have just enough water to wet the surface of the rocks. Then we add two level tablespoons of medium silicon carbide grit (about 150/220) and two level tablespoons of water. We then allow the machine to run for 12 to 24 hours. Then we rinse the rocks and add fresh grit. Continue 12 to 24 hour runs with medium grit until the rocks are smoothed to your preference - usually three or four runs. Wash the rocks and barrel thoroughly. Then run 24 hours with water and two tablespoons of fine grit (500 or 600 silicon carbide). Wash the rocks and barrel throroughly. Finish with water and two tablespoons of TXP Polish or Rapid Polish for 24 hours or until polished. The process is that fast. The Lot-o-Tumbler uses about 50% as much grit as a rotary tumbler of similar size and about 25% of the electricity per pound of rock. The polish is usually awesome! We have polished a lot of jasper, agate, petrified wood and natural glass in a single Lot-o-Tumbler. Read the full description on the product page. This tumbler must be glued to a concrete block or the floor for proper operation. More Information! Process twice as much rock in the double barrel Lot-o-Tumbler Twin. It has two barrels that each process about four pounds of rock (eight pounds total). This is a very economical tumbler to operate because of its small grit and electricity consumption per pound of rock. It is also economical to purchase. For a small price increase over the Lot-o-Tumbler Single (shown above) you double your productive capacity. For proper operation this tumbler must be glued to two concrete blocks or to another stationary object. Also, both barrels must be loaded for proper operation. If you don't have enough rock to use both barrels, simply fill the other barrel with ceramic media and a little water and it will do fine. More Information! Instead of allowing our rocks to run for a week in a rotary tumbler for the medium, fine and polishing steps, we do that same work in a vibratory tumbler in one to three days per step. It more than cuts our tumbling time in half - and at the same time, cuts our electricity bill. The amount of grit and polish saved is also substantial. We have an article that explains how much money you can save on grit, polish and electricity with a vibratory tumbler. In a rotary tumbler the rocks tumble in rotating barrel. In a vibratory tumbler the rocks are shaken in a bowl. The rotary tumbling process does a better job of rounding the rocks. A vibratory tumbler does not change the shape of the rocks as much. We like our tumbled stones well rounded, so we get that done by running them in coarse grit in a rotary tumbler until we are satisfied with their shape. We feel that the rounded shape is worth spending the time and the electricity. However, as soon as we have the shape that we want the rocks go straight into a vibratory tumbler for the medium, fine and polishing steps. Vibratory tumblers take a little more learning and experimenting than rotary tumblers. The challenge is getting the amount of water right. 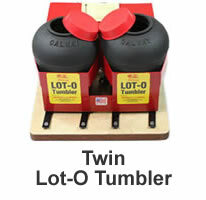 (We have instructional videos with an article for the U-V10 and Lot-O-Tumblers, please check them out. We take special effort to show you how to get the moisture level right.). There should be just enough water in the barrel to keep the rocks wet as mud accumulates during the run. We check our vibratory tumbler a couple times a day and add a couple tablespoons of water as needed. The amount of water needed depends upon the size and shape of the rocks and how fast they cut. A bowl full of tiny rocks takes a bit more water than large rocks because they have a higher surface area. And, fast cutting rocks require more water than slow cutting rocks because you need enough water in the barrel to keep the mud thin enough for a nice tumbling action. When you are first learning to run a vibratory tumbler, check it several times per day until you learn how things work. Once you understand, then the only time you need to pay extra attention is when you are tumbling a new type of material.